I am an avid home cook and also a huge Pizza's fan. I have tried making Pizza multiple times at home until I realized the secret of it - Pizza Dough. It may sound not too hard to make some pieces of Pizza Dough. However, you must have always wondered why homemade Pizzas don't taste like those made by the professional chefs in the restaurants. After so many trials and fails, I've accumulated the experience. And I'm more than happy to share it with you. Let's now explore my cooking stories. If you are looking for a heavenly dish that almost people are crazy about, it is undeniably pizza. All people from the old, adults and kids love pizza. The Italian dish has evolved over centuries to become the most popular food worldwide. To make an appealing pizza, pizza dough plays the central role. Although working with pizza dough is considered easy, we still fail to make perfect dough, which then ruins our pizza. The dough decides what style of crust you get after baking. Therefore, you need to pay attention to your desired crust before kicking off making the pizza dough. Likewise, strictly following directions is of great important to the step. The key ingredients for pizza dough include flour (normally bread flour, all- purpose flour and whole wheat flour), yeast, olive oil, and salt. Some pizza makers may come up with other ingredients to add new flavor to the dough, but it is not recommended. You need to keep your dough simple and original. In case you are up to ears in your own business and don’t have time to make pizza dough own our own, just drop by a store and supermarket to get some ready-made dough. If you love cooking and want to have the home-made dough, the article is exactly what you need. The article aims to introduce you some great ideas with your pizza dough. Well, obviously you will be provided with the awesome instruction about what you need for a pizza dough recipe. Then, you can’t skip a comprehensive guide on how to make pizza dough. Finally, Tips on how to get best pizza dough and mistakes pizza makers usually have will be mentioned so that you could gain something useful for yourself. Kick off your work of making pizza dough by preparing some ingredients. Luckily, the dough is made of simple and popular ingredients including flour, olive oil, yeast and sugar which you could pick up at any grocery stores or supermarkets. When it comes to making pizza dough, the first thing that comes to our mind is certainly flour. In fact, bread flour, all-purpose flour and pastry and cake flour are the most popular types of flour for making pizza dough. However, each kind of the flour brings different crusts, which is caused by the different amount of glute﻿n the kinds of flour contain. To be more specific, gluten which is a protein can create elasticity in your dough when it becomes wet. Therefore, how much gluten is contained in your dough determines how chewy or rubbery your crust will be. In fact, only bread flour and all-purpose flour are widely used in making pizza dough thanks to the proper amount of gluten they contain while cake and pastry flour are not popular. Due to the lower level of gluten in the type of flour, it certainly brings you a chewy crust, which no one wants to bite. All-purpose flour has about10- 12% gluten (a low level of gluten), making the dough somehow harder to stretch out. Therefore, all-purpose flour should be ideal for Sicilian and deep-dish pizza crusts. It could work well in thin crust Neapolitan-style and New York style pizza as well. Bread flour, which contains a high level of gluten at12-14%, is sure to bring you a crust chewy in the center yet crispy on the outside. If you tend to add some crisp to your thin crust or New York style pizzas, bread flour is exactly what you need. If you want to get your crust thin in the center yet puffs off outside, use Caputo Tipo 00 flour. The four have 12, 5 % gluten, which gives your dough enough elasticity for a chewy but not rubbery crust. Another important ingredient for a perfect pizza dough recipe is olive oil. We might think that we only drop by any supermarket or grocery store then could buy a bottle of extra-virgin olive oil, but the fact is more than 70% of olive oil in the market is not real. Some people may suggest doing the burning, tasting or winterizing tests to check whether the olive oil is real or not. However, the tests have been proved unreliable. The best way to get real olive oil is to buy it directly from farmers who grow and process olive oil. If you can’t find any local olive growers, try to seek for some online olive oil stores. Obviously, yeast is indispensable for making pizza dough since it is the key ingredient for fermentation and dough rise. There are two popular type of yeast for making pizza dough: active yeast and instant yeast. While instant yeast could be added directly into your flour, active yeast need proofing before added into flour (proofing means you have to dissolve the active yeast in warm water and set it aside until the granules are activated). In fact, both of the types of yeast don’t make much difference for your dough and finished crust. Hence, you don’t need to take what kind of yeast to use into account. Besides the 3 main ingredients, you also need to prepare some sugar, salt and surplus flour for dusting. Note: Many people like to add some ingredients to pizza dough, but the truth is the pizza dough should contain nothing more than flour, water, salt, yeast, and oil. Of the ingredients, the key one is flour. You should choose types of flour based on the style of crust you want. For yeast, live or activated seem preferable for pizza dough, but if you couldn’t find live yeast, dry yeast could work so well. Hereunder is a comprehensive and detailed guide for a down-to-earth pizza dough recipe you could do at home. Please note down if you find it interesting and don’t hesitate to share with your friends and family. You absolutely may mix dough flour by hand or with a mixer based on your preference. In case you have a mixer, your jobfor the steps 1 is much easier. In the bowl of the mixer, put a pinch of sugar. ↓ Then put 2 tablespoons of dried yeast, 1 tablespoon of salt. ↓ 4 cups of flour and turn on the machine. ↓ add the water and 2 tablespoons of the olive oil while the mixer is running until the dough is turned into the form of a ball. ↓ Add a spoon of flour per time if the dough is too sticky until the dough forms a solid ball. ↓ For the too dry dough, add water (a tablespoon each time). If your make pizza at home, the dough must contain more water. It could be explained by the fact that homemade pizza is baked longer in your home oven, therefore, need more water. You need to get your pizza dough 50 percent water. But don’t let it go too soggy. Soggy pizza dough is hard to shape and may stick to your hand when you are kneading. Especially, it may cause stuck pizza after baking. To work out the ripping, flour the dough with more flour but not too much. Also, try to bake the dough on a pizza stone instead of a tray. Turn the dough out onto a flour-dusted surface, knead for 6 to 8 minutes until elastic and smooth. Then, divide the dough ball into equal pieces. In fact, kneading pizza dough by hand brings you a superior pizza crust. Flour the work surface and then turn the dough onto it. Keep kneading the dough constantly, rhythmically and steadily. Don’t knead too slowly or quickly. Especially, you need to bear in mind that never let the dough rest too long while kneading. It may ruin your dough. If you feel tired, get someone to help you continue the kneading process. After kneading, coat the dough with oil, then Cover the bowl with a white towel and leave the dough rest in a warm and draught-free place for about 30 minutes until it doubles in size. before moving to the next step. Put it into a resealable bag or plastic container and store in a refrigerator. Cold fermentation enables gluten in your dough digest carbohydrates, which improves the flavor of your pizza. Then, turn the dough onto a flour-dusted work surface, cut the dough into pieces (each piece counts for a pizza crust). This is a small trick that not many people know. Many of us keep the big dough and knead it, then divide the kneaded dough into small pieces. But in fact, the big dough is more difficult to knead and shape. Knead the dough gently with your hand on the floured surface and roll and flatten it into 20 cm disc. With your knuckle, stretch the dough ball from the center to the edges. If you find it hard to work with your knuckles, you could use the pin instead to flatten from the center out. But remember to move your dough, not your hand or the pin. Try to keep the dough in invent thickness. 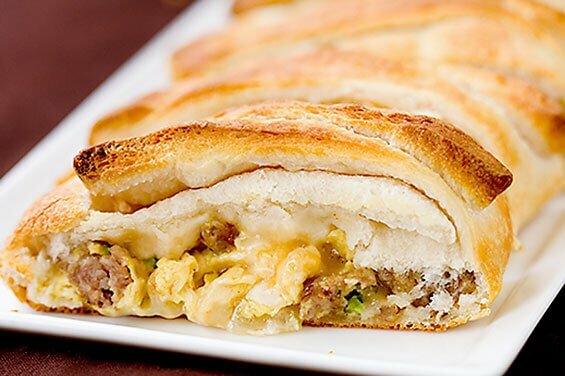 Too thick dough may not support sauce, topping, and cheese. Meanwhile, keep the dough well-floured to get a smooth one. If the dough shrinks and refuses to stretch out, leave it to rest for about 5 minutes before continuing your work. In case you buy ready-made dough at the store or take your home-made out of the fridge, you find the dough too hard and difficult to stretch out with your hand. Then, you strain your muscles to deal with the dough. That you overwork the dough could bring you a hard crust none wants to bite. Instead of immediately working with the dough, leave it to rest so that the dough gets closer to the room temperature to make the dough softer. Then you could easily stretch it out. You strictly follow the directions, but your pizza dough turns out not to be what you expect. You may make small mistakes that ruin your pizza dough. Let’s check the following mistakes. Perhaps you may find something to work out your problem. Many people think that using bread flour, wheat flour, and all-purpose flour doesn’t make any differences in pizza dough. In fact, each type of flour has a different level of protein; therefore, bring you a different style of crust. For example, for a crispy yet chewy crust, wheat flour is certainly what you need thanks to the significant amount of gluten-forming protein. Bread flour with the medium level of protein yields crisp and bready crust. Meanwhile, a thicker and softer bike like crust requires a low level of protein in all-purpose flour. Therefore, you need to decide what crust you desire to choose the most appropriate flour for your dough. Undoubtedly, pizza dough is equally important as sauce and topping to make a perfect finished pizza. Some of you may want to add some ingredients like basil or oregano to get your favorite flavor and taste. In fact, adding the kind of ingredients may be counter effective. Since the added ingredients possibly change the texture of pizza dough, you may not get your desired crust. If your dough does rise, perhaps there is not enough yeast for yeast fermentation. Increase yeast in your formula for the next batches and see whether you get a proper rise. Another reason would be the lack of time for rest. You need to keep in mind that the dough has to rest for AT LEAST 1 Hour to get arise. Temperature could account for the problem. As usually, you wrap your dough and set aside until it rises, but if your room is too cool, the dough can not get a proper rise. Instead, you need to keep it a warm place. Taking your baked pizza from the oven, you find out that the pizza crust just blows like a balloon. A couple of small bubbles on your crust may be funny or even lovely, but many huge bubbles are certainly a problem. When it comes to major problems with pizza dough, we can’t skip the stuck pizza. It is when your pizza is a truck to the peel. If you get into the trouble, maybe you don’t use enough dusting flour. Always flour your working surface before turning the pizza dough onto it. Also, sprinkle the dough top with more flour so that it doesn’t stick to your hands. You could brush the surplus before putting it on the peel, so do be afraid if you over-flouring your dough. Your peel can cause the problems too. The mental peel may increase the possibility of getting stuck pizza since mental heat up so fast, and when moisture is emitted, your crust sticks to the peel. It is advisable to use the metal peel for retrieving your pizza. When baking pizza, you should use a wooden peel to prevent it from sticking to peel. When the gluten in the dough hasn’t developed enough, it causes a holy crust. When you can’t stretch out your dough naturally, possibly it hasn’t got enough time to proof. Then, to fix your dough, leave the dough to rest on a flour-dusted surface for about 10-15 minutes. Many of you prefer using a rolling pin to roll out your pizza dough since you find it hard to do it by hand, but the truth is pressure from a rolling pin is too hard for the dough. Then, you are sure to end up with a light and airy crust. Instead, it is more advisable for you to do the rolling out by hand. Use your knuckle to stretch out the dough to the desired thickness. In case you find the dough spring back, you have to leave it to rest for a few minutes before continuing your work. 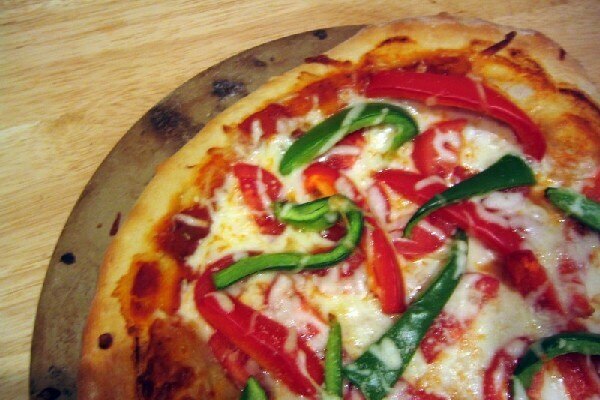 If you are a dieter yet a big fan of pizza, you could try the spicy three-pepper pizza. Are you a big fan of seafood? I guess many of you are about to say yes. 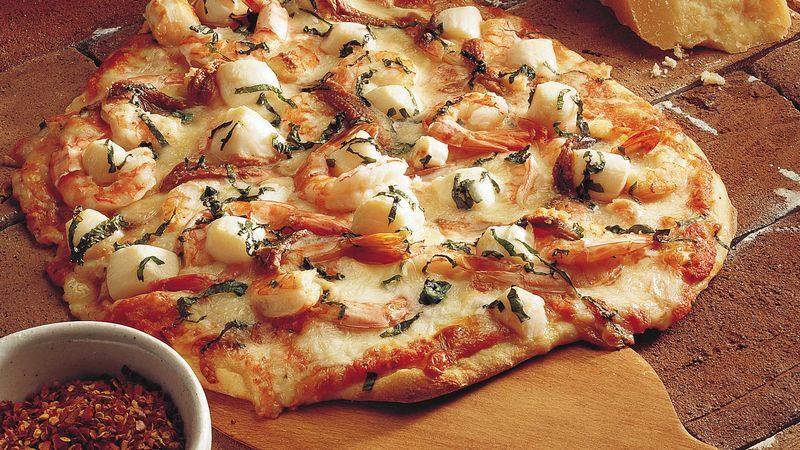 In the case, you are unlikely to resist a heavenly seafood pizza. Let’s see how it is made. If you find traditional pizza some kind of boring, why don’t you come up with the Muffin Pan Pizza Rolls? Especially, if you have children, your kids will certainly get excited with the new and creative kind of pizza. If pizza is not your cup of tea, you could use pizza dough to make awesome dishes. Let’s see what you could do with pizza dough besides making pizza. Don’t skip the recipe for grape and pine nut dessert Focaccia if you want an awesome dessert dish. Remember that the keys for desired pizza dough are the kind of flour you choose and strictly following instructions as well as time in the recipes. Especially, making pizza dough is the most time-consuming work when making pizza, so instead of preparing in during the weekdays when you are up to ears with your business, you had better do it on Sunday when you are left with more time for the job. With the thorough and in-depth guidance, I hope you may find something to work out your pizza dough.